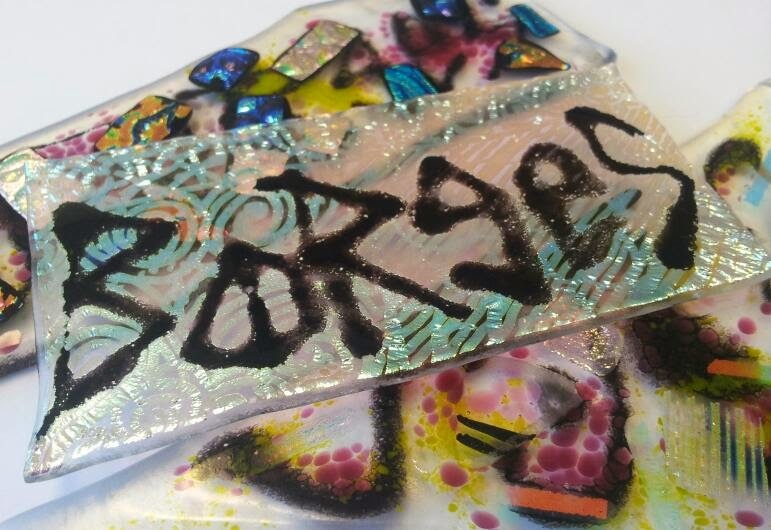 By now, many of you have probably heard of Journal52, a new workshop in 2014 that is currently spreading throughout the art journal world. What an honor to have an opportunity to interview its creator, the lovely Chelle Stein. Q: Chelle, one of my favorite things about 2014 so far has got to be Journal52! For those that don’t know you already, who is Chelle Stein? What is your art/journaling background? And how would you describe Journal52? A: Glad you are enjoying Journal52 and thank you for this opportunity to be interviewed! 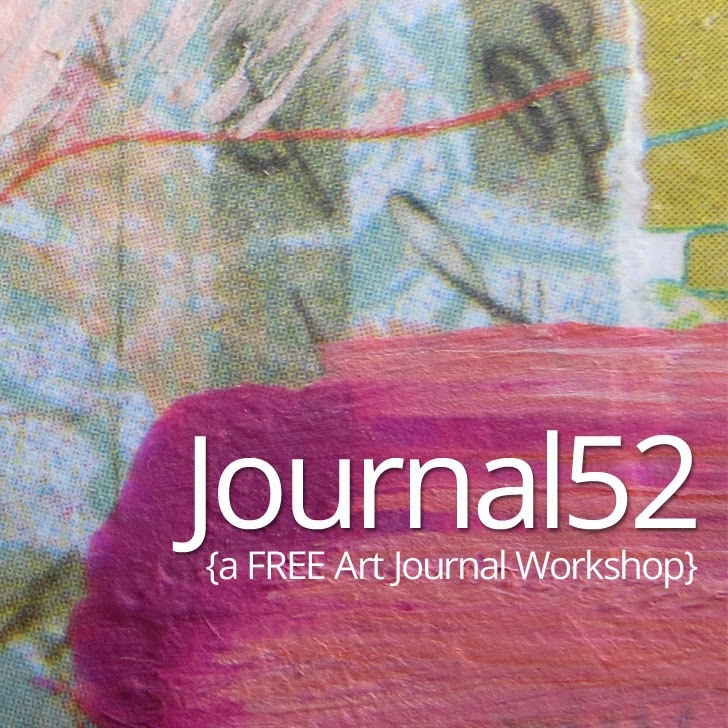 For those who are not familiar with Journal52 yet – it is a free art journal workshop with weekly prompts to keep everyone participating motivated, inspired, and creating all year long. The response has been amazing and it's so exciting to see so many people from all over the world come together to share, create, and encourage one another! 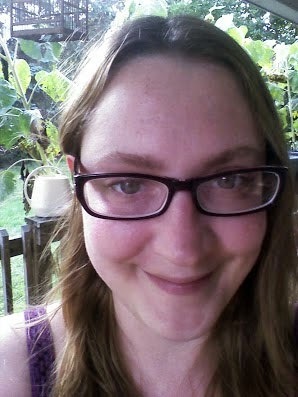 As for a little bit about me, I'm a 32 year old girl from Pittsburgh who loves to create. I'm married to a wonderfully supportive guy and we have three kiddos who always keep us on our toes! All of this started for me when I was about15 or 16 years old – I would buy blank journals and just fill them up with everything and anything –newspaper & magazine clippings, drawings, poems, quotes from my friends – I had stacks and stacks of notebooks. I took a break from my journals for several years and that was one of my biggest mistakes. At that time, I didn't think it mattered – I thought oh, gotta pay the bills, gotta take care of the kids, gotta clean the house – it really took its toll on me emotionally and physically. Then I was diagnosed with Bipolar Disorder... that really woke me up to realize that creating – whether it be art, writing, music – anything – was a really important part of who I am and a vital part of staying healthy and being well. So I started to get back into doing what I always did, and to my delight and surprise I learned that what I did had not only a name, but an entire industry built around it with books and magazines, YouTube videos and products galore! 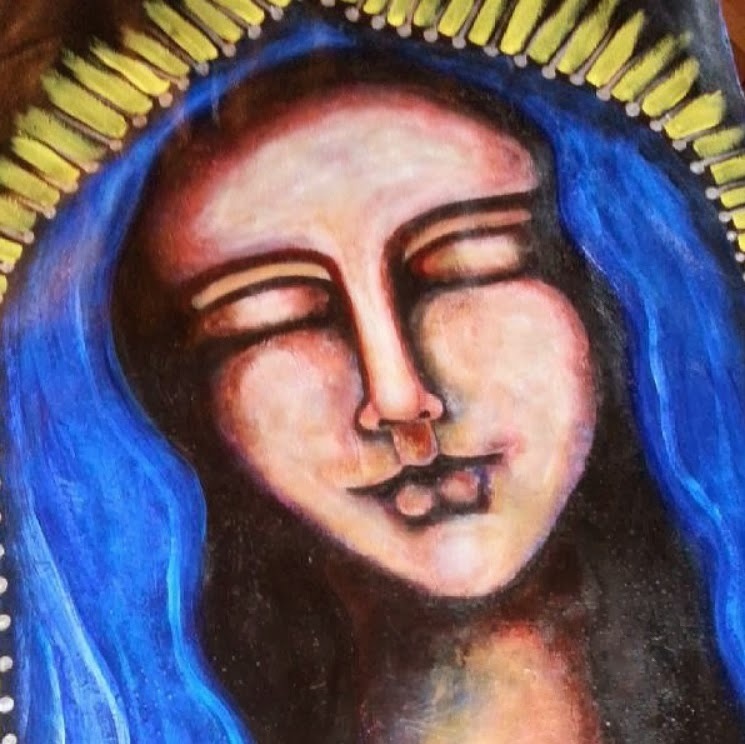 Last April I created the website www.ArtJournalist.com where I started sharing the different things I learned and was experimenting with in my own journals. This year I wanted to offer something special for all of my subscribers and Facebook fans – so I created Journal52 – and to my amazement it has grown into a fantastic community of people and inspiration! Q: Journal52 has just exploded in the last few weeks. Last I heard, there were something like 2,000+ individuals participating. It has been so inspiring to see you in action and to see art created by so many others (artists of all ages and backgrounds, first time art journalers, even kids!). Why do you think it is resonating with so many? What do you hope others get out of it? And how has it impacted you/your art/journal practice? A: We now have over 4,000 creative individuals just in our Facebook group alone – it is very exciting to see so many people come together and share their work with one another! I think one of the reasons it resonates with so many is because it is so accessible – there's no gigantic expensive supply list, there's no cost to join, and the community aspect on Facebook gives everyone a chance to share their work and ask questions. I've received so many touching emails and messages thanking me for this workshop, how it's helped them and why they are enjoying it – words can't even express how much those little notes mean to me. My vision for the workshop is to inspire others to just relax, let go, and create. I wanted anyone who wants to participate to be able to join us and find a way to be creative – with no worries about cost or ability or skill. 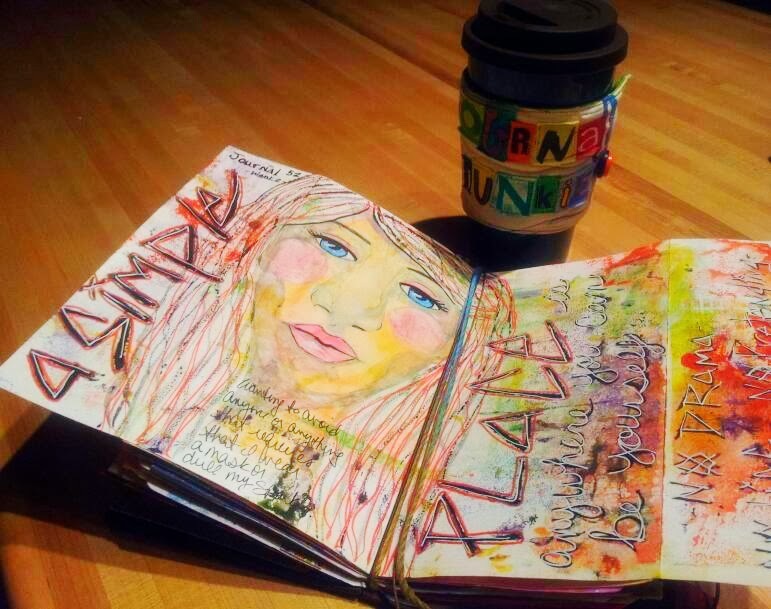 I've always said, you don't have to be an artist to enjoy art journaling. My hope is that everyone who is participating can find some type of inspiration to get started and just create something – anything! 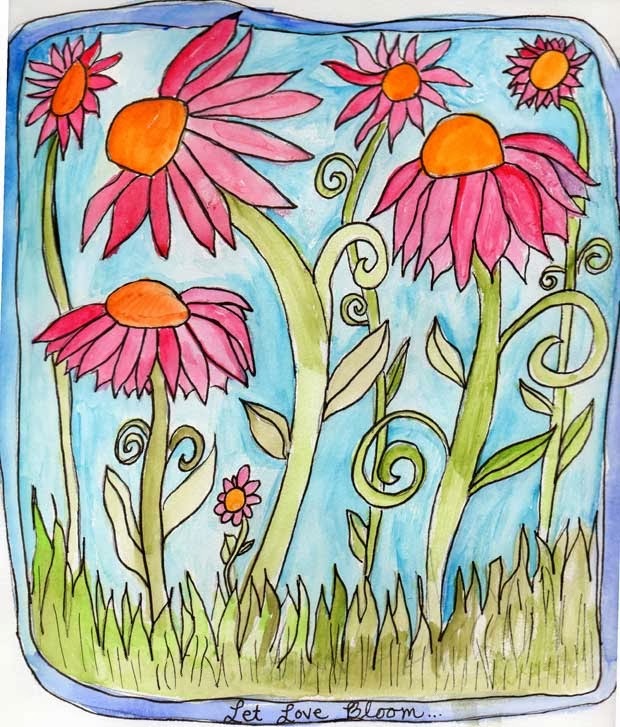 Even if it's just with crayons – creating is such a great way to relax, let go, and just be mindful of the moment. It's really been beneficial for me as well – having 4,000+ people waiting for me each week has really helped me be more dedicated to my practice of art journaling. I'm a terrible procrastinator, so Journal52 is helping me be more focused and creating on a schedule. Q: The prompts and pages are wildly different from week to week. Where do you find inspiration? And is Journal52 reflective of your process for your own art/journal? A: I find inspiration EVERYWHERE. I get my best ideas when I disconnect from the internet. I look through books and magazines, and then just sit down with my favorite pen and a composition notebook and write out ideas until I think of something. Music is also a big inspiration for me. I have a list right now of over 150 different prompts and quotes, so there's definitely enough to keep us creating for this year and beyond! For my own art journal, I just make whatever happens and what I'm thinking about when I sit down to create. Sometimes it works, sometimes it doesn't – but that's the best part – there's always a new page to turn to and more paper! Q: You have a message of frugality and encourage others to use what they already have on hand. I love that! 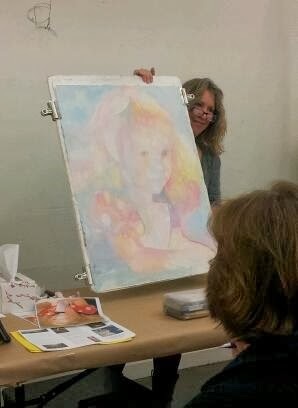 What are some art supply lessons you have learned along the way? And what are your favorite art/journal supplies, especially for newbies? A: It's so easy to be swayed into thinking you need the latest and greatest art supplies and to spend a small fortune in the process, just to learn that maybe those aren't the right mediums for you. Art journaling is such an individual process – which is why I stress using what you have and what you're comfortable with using. The hardest lesson I've learned through trial and error is to let paint and adhesives dry between layers and writing on them– I can't tell you how many pens and markers I've destroyed or what weird colors I've made because I couldn't wait for paint to dry! I finally got a heat tool a few weeks ago – oh my, what a difference that has made! Some of my favorite supplies I recommend for beginners: matte gel medium for collage/as an adhesive, student grade acrylic paints, and old books and magazines from thrift stores to use as collage materials. I recently also received a wonderful gift of Sakura Koi watercolors which I am so thankful for – they are so vibrant and fun to use and I would recommend them for anyone who wants to get started with watercolor painting. 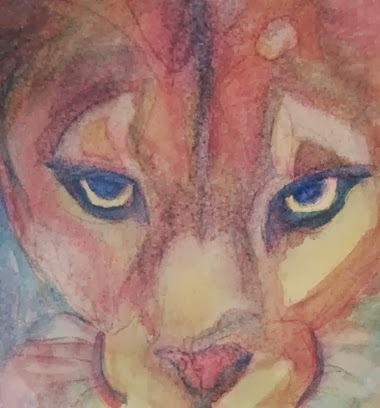 I have a lot to learn about watercolors, but I'm enjoying them immensely. Q: Any other advice for new artists/art journalers? A: Just dive in and keep practicing and learning! I think the two hardest things when just starting are finding your style/voice and getting past that fear of creating. So my suggestion is just keep creating and making stuff – you WILL get better the more you do it and practice and eventually you will find a style that's unique to you. The important thing is at the end of the day you took some time with yourself to create – that's what really matters. Q: Your Journal52 art journal pages are so positive and cheerful. Has it always been this way? How has your art/art journaling practice evolved over time? A: My art hasn't always been happy stuff, no – because as we all know, life is not always happy. But with art and anything in life – you have a choice. You can dwell on the sad stuff, and sometimes it's good to get those really emotional pages out of the way – but in the end I'd much rather make art that lifts me up when I look back at it. For me, life is about living in the moment, so I don't really dwell on the stuff that's happened to me – I've learned to let it go and move on so even if I do create something that's emotional, I usually don't keep it. Once it's on paper, it's out of me and I'm done with it and ready to move on to the next thing. I'd much rather focus on the positives in life! Q: How are you able to manage the personal connection you seem to have with so many others? What strategies are working for you? What have been some of your challenges and how are you overcoming them? A: My biggest challenge right now is that I want to comment on each and everyone's lovely art pages and tell everyone how amazing they are - however with thousands of pages each week it's just not physically possible. So I am really happy to see everyone in the group commenting on each other’s work and liking each other’s' posts. To stay on top of everything else, I've been using Evernote – it is the most amazing and awesome organization tool ever invented – I use it to help organize the prompts, collect inspiration for ideas...it's really helpful for keeping track of everything in one place. I've also found it's important to give myself a schedule for checking email, looking through photos, moderating posts and comments, etc. - because it can really interfere with family and life balance if you're not careful. I try to unplug for several hours each day though that sometimes takes more discipline than I have! Q: What advice would you give to others who want to attempt launching something like Journal52? A: It's cliché – but just do it! Write or doodle out a plan and make it happen! Keep it simple, create from the heart, and share your unique gifts with the world. A: My mind is always racing with ideas and possibilities for what's next. I have some pretty big, wild dreams that are going to take a lot of planning, work, time and the help of others. But I do know I will always be focused on making art accessible and using art to help people. Wow, over 4,000 and still growing. Congratulations, Chelle. 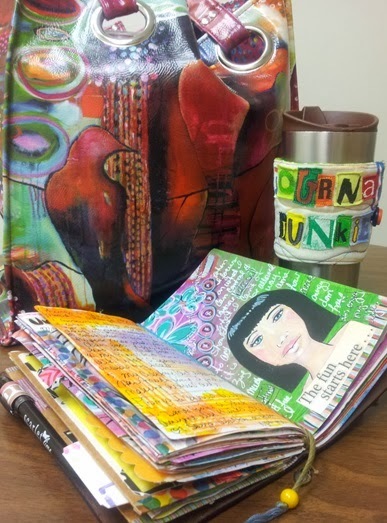 Thank you for the positive impact you are making in the art journaling world. Wishing you all the best in 2014! I have been reading “The Artist’s Way” by Julia Cameron. (Love it!) And while I don’t follow all of her teachings and recommendations in the book, I am happy to follow her suggestion of taking myself out on a regular “Artist Date.” I have decided I want to put more focus and attention on this in 2014 and so I have created a monthly insert for my Midori Traveler’s Notebook. Sure, I could buy a monthly calendar or even download a free version, (for example, check out the amazing resources offered by Ray Blake at: http://www.mylifeallinoneplace.com/p/midori-tn-inserts.html ) but I didn’t find exactly what I was looking for. 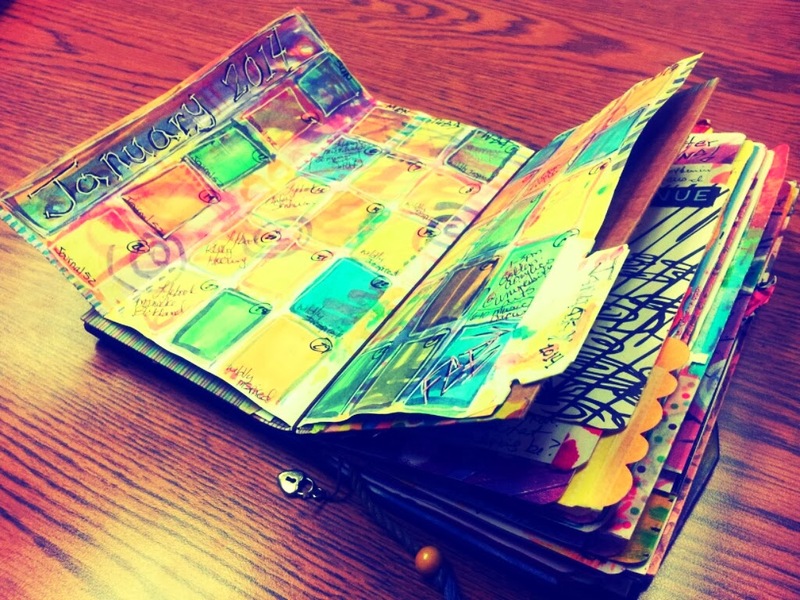 And besides, this is for my art journal…isn’t it more fun to create your own? Step 1: Knowing that my Midori inserts need to be approximately 8.5” x 8.25” (folded to be approximately 4.25” x 8.25”), I started with an 8.5” x 11” page set to landscape orientation. Step 3: I inserted some simple shapes such as rectangles with rounded corners and a couple of lines. 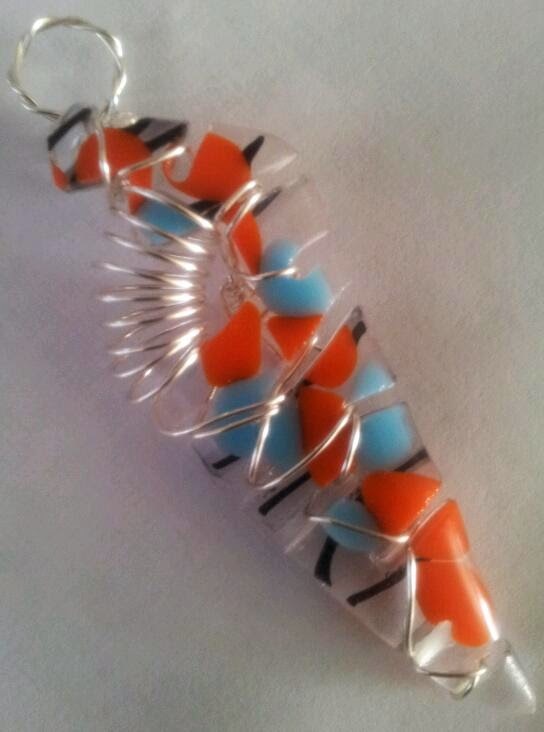 I made them brightly colored at first so they were easy to see. 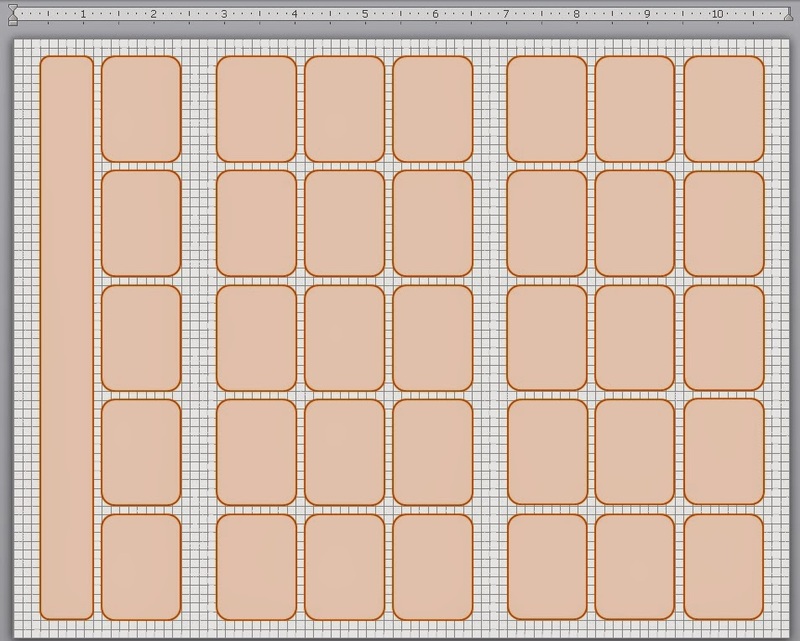 I then played around with size and layout, copying and pasting the rectangles, etc. until I came up with an initial design. Step 4: When I had something I thought I liked, I hit the print button and then folded it to see if it lined up the way I wanted it to. Step 6: Then I went to town! I added color with Soho Urban Artist watercolors, Uni Posca paint pens, and Gelly Roll pens on both sides, making lots of random marks as a first layer. I then used watercolors to fill in the boxes (using the faint lines as a rough guide) and further embellished with pens, added days of the week and calendar dates, and added the month/year. Step 7: For this go round I simply wrote in anything that counts as an “Artist Date.” But for the future, I printed off the calendars for the classes I am currently taking so I can cut up little visuals to paste in some of the boxes. I printed everything in black and white so I can doodle and color in the faces/images with watercolors, pens, etc. Sort of like “inchies.” Can’t wait to see what some of my favorite artists look like all doodled up! ;-> I will continue to add anything that counts as an “Artist Date,” including classes I am taking, free journal prompts/videos that get posted regularly, any art hangings, fairs, etc. I participate in, musicals, theater, trips to a museum, etc. Step 8: I also added a tab. I will use the outside of my calendar insert to capture goals and to-do items for the month, stuff to be added to future months, etc. And when I’m done journaling for the month, the calendar will make a nice outer cover for that month’s insert and the tab will help me keep everything organized by month. HINT: If you pre-plan what you are going to use as your tab, you can use it to clean off your brush as you paint. That way it has some random paint on it (and looks all artsy) while still coordinating with the page. Oh, and check out my cute little coffee cozy...it says "Art Journal Junkie." I had someone on Etsy make it for me (sewing is NOT one of my talents). I am taking a couple of classes this year as well as getting weekly doses of FREE inspiration, including Lifebook 2014, Gorgeous Girls 2014, Journal52 (Free offering from Chelle Stein), and Wildly Inspired (Free offering from Effy Wild). I am enjoying the consistent jolts of inspiration. While I am not completing all projects (and ones I do are very much my own interpretation and in my own style), I like the overall structure of getting regular communications and prompts. The Facebook groups that support these classes and offerings are another great source of inspiration and a wealth of knowledge. Such a pleasure to be a part of these great communities. In the past I have resisted taking classes, but I am so glad that I have and see myself doing so in the future. Not ready to make the commitment? Think you are too much of a newbie to take a class? If so, I would encourage you to check out Journal52 and/or Wildly Inspired. What 2014 classes/offerings are you participating in? And now for the exciting conclusion of Effy Wild: The Interview where I dig into her business side….Enjoy! Q: I recently participated in your Moonshine: Mother program. Just like in my experience with your previous BOD work, you again challenged and inspired me. Week after week I was really impressed with the amount of work you had put into the program structure and content (both art and topic exploration). When did you know it was time to make the leap from artist to business woman? A: In 2010, Connie Hozvicka invited me to teach in the very first 21 Secrets. That vote of confidence informed me that I had something to offer. It was a very scary time for me because I didn't feel even remotely qualified to teach anyone anything, but I realized that my experience as a writer had prepared me to teach people how to develop a practice. It wasn't long after that I began to dream up classes of my own, and LEAP! I threw myself into with passion (if not expertise) and excitement (if not business acumen!). The most important thing I learned in that time was that enthusiasm is as important a quality to bring to teaching as expertise. You do NOT need to be an expert to begin. 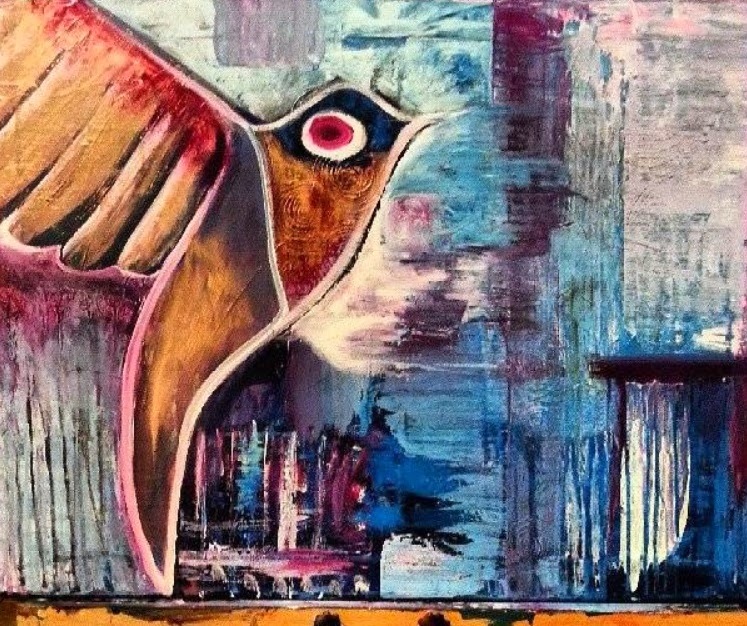 Q: How do you maintain a balance between art and business? A: Honestly? I don't. I struggle with this mightily. There isn't a day that goes by that I'm not asking myself how I can leverage whatever I'm doing so that it can be included in my business. I'm not in a place where this is bothersome, though. I know for sure that if I am teaching it, I am committed to it, and that means I work prolifically and regularly. Teaching is my cure for resistance and procrastination (two things I struggled with a great deal before becoming a teacher). It is also my guarantee that I will always be learning, which is my heart's fondest, most cherished endeavor. Q: What have been some of your business successes, challenges, and lessons learned? A: My biggest challenge in business was boundaries. When I first began teaching, I wanted to be everyone's friend. I wanted to be universally liked. I wanted to avoid any and all conflict and please everyone. This, as you can imagine, drove me bat crackers. I had to learn how to do what was best for *me* at the end of the day (boundaries!). I had to learn that if I'm doing something valuable, I will not be universally liked. I had to learn that success breeds envy in others, and I had to let go of my inherent need to dull my shine to make other folks comfortable. I'm shiny! I like being shiny! If people are envious or mean spirited in the face of my success, that is no reason to go quiet and stay small! Learning that took two years and a lot of therapy. My biggest success has been in the area of community building. I don't just have a 'network', which is absolutely crucial if you're marketing classes! I have a bona fide tribe. My students are incredibly loyal and there is a core group who return class after class, year after year. I reward loyalty with time, attention, and major discounts, because there is nothing more valuable to me in my creative business than loyalty. Q: You have built an amazing “tribe” over the last few years. What have been your most successful strategies? A: I am myself at all times. That's it. I am loudly, proudly colourful. I am accessible. I maintain a sense of connection with my people. I don't produce classes for the money. I produce classes for the *joint experience* that we will all have together. I don't set myself up as a 'leader'. I stay in the trenches with my fellow artists and we work *together*. I believe in shared power, not power over. I believe in power *with*, and I create spaces in which that can be experienced and expressed. I also just love the people I attract. Like, madly. And by 'love', I mean in the verb sense. My work is service. I am in it for us all. I feel blessed and grateful that I am so supported by my community, and in turn, I do my best to support them. Q: Maintaining your web and social media presence must be daunting and quite time consuming. How much time do you spend on your website? Using technology to create videos? Various social media sites? Maintaining and distributing electronic newsletters? What are your favorites/least favorites and what trends do you see emerging? A: My website is the least time consuming part of my business. I spend about an hour 'in it', either blogging or administrating comments every week. I spend several hours every day in the groups I run on Facebook (the glitterhood, and the groups established for my classes). I spent about an hour a day dealing with emails and processing orders/answering tech questions. I spent, on average, 8 hours a week recording and editing video. I spent about a half hour a week on my newsletter. Q: What words of wisdom do you have for artists that are just beginning to explore the business side of the arts? A: Take Business Goddess by Leonie Dawson (http://tinyurl.com/ly84pj6) and Flying Lessons by Kelly Rae Roberts (http://tinyurl.com/n2oevmw). Know that you may lose 'friends' as you begin to succeed, but your real friends - those who love you - will be supportive and excited for you. Establish a council of people you trust who can be there for you when you need to vent - preferably people who don't want what you've got. Be wary of people who want to get close to you very quickly. Maintain good boundaries. Get good rest.